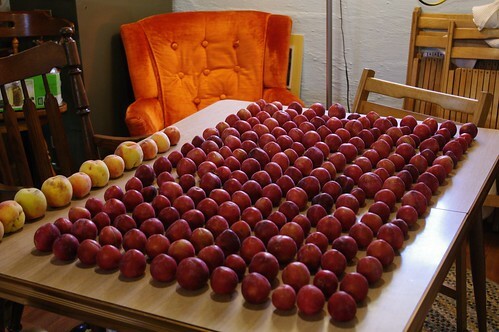 When you lay out half a bushel of plums on the kitchen table, they look like so many terra cotta warriors preparing to defend their turf. 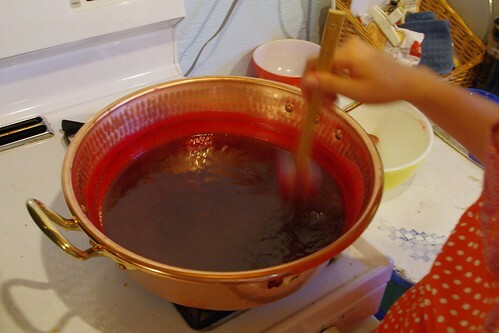 Or maybe it’s Spartans preparing to march into the mouth of the beast jam pot. Whatever they are, they were bravely processed to defend us from the privations of winter, and we are deeply grateful for their service to our nation. Over the last week or two, we’ve been jamming, both musically and gastronomically. Perhaps more appropriately, Allie’s been doing the cooking half, and Nick’s been more responsible for singing Bob Marley at her over and over and over again. It’s really a collaborative effort here on the farm. She jammin, she jammin, she jammin, she jammin. Alternatively: stir it up, little darling. Stir it up. For as much as Allie’s been doing the actual cooking, we’ve both been finding/foraging for ingredients. Plums and peaches were from Paul Plum at our farmers’ market (hooray for seconds!). Some organic lemons and oranges came from California via Wegmans. But just about everything else came from our own little agricultural bounty. Blackberries from the patch behind the house. Elderberries from the ruins of the old house. Tiny apples from an until-recently-neglected tree near the house. Let me lay this out for you: free things are awesome. At least in the long run. Apples? Straightforward. They aren’t the tastiest things in the world on their own, as the trees have been neglected for too many years. A family friend pruned them way back last year, and they’re actually producing again — teeny, tiny, pectin-packed apples about 1.5 inches in diameter. 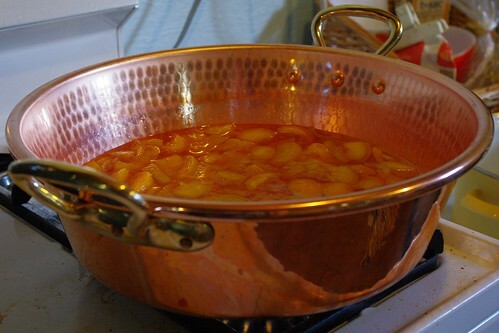 Science fact of the day: pectin is what makes mashes of fruit and sugar into jellies and jams. Some fruits have it, some don’t, and apples are a common additive when the main fruit is a little lacking. 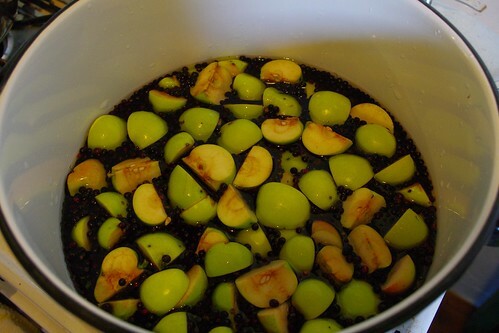 Now elderberries. 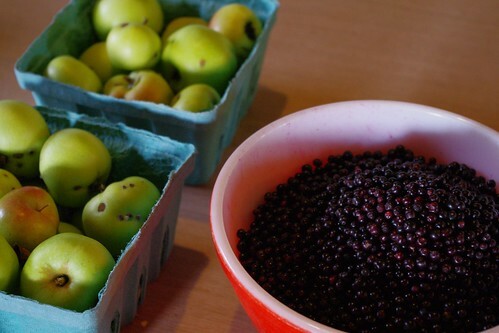 Elderberries are an interesting thing. 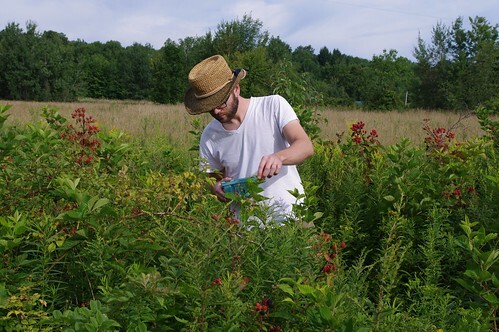 Our original plan was to harvest 3 gallons of berries and make up some elderberry wine. Considering that each berry is about 1/8 of an inch in diameter, each one is about 0.000004 gallons. So you’d need 750,000 berries to get to 3 gallons, realistically probably about 500,000 factoring in packing density and air gaps. 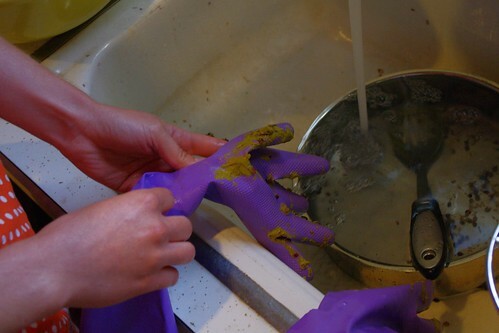 The stems and seeds also contain a resin that comes out when you cook them, resulting in an accumulation of what looks like a jaundiced chewing gum all over whatever you’re stirring with. Never witnessed the spontaneous and entirely unexpected creation of chewing gum all over a spoon? Yeah, that was a new one for us, too. Elderberry goo. Creepy, creepy elderberry goo. So to recap: tiny berries, tough location, mildly poisonous, difficult to process. It leads to a question that we often ask about things: who was the first person to think, “gee, this seems like a good idea”? In the days before country folk could easily get to a store, I suppose if this is the only way you have to acquire alcohol, you do what you need to do. But we didn’t make alcohol. Turns out a five gallon bucket full of stemmed berries only give you about 2 gallons of berries. 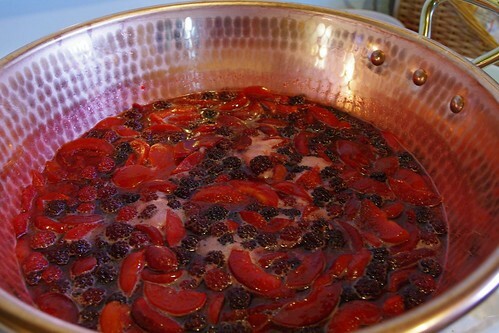 We caved and made jelly and elderberry syrup instead. At the end of a long couple of jamming days, here’s what we wound up with. After about 50 jars, the jamming continues. We’re hopeful that more peaches will be on the way, and there are big plans for some tomato varieties. Many of the recipes came from the very excellent Blue Chair Jam Cookbook. 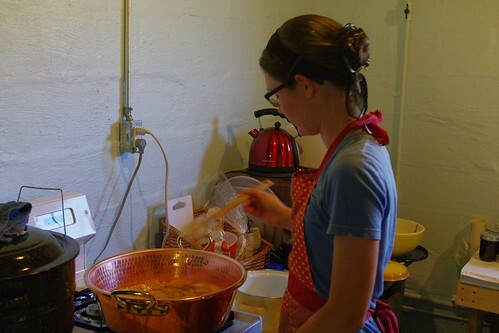 If you have any questions or want a recipe, holler at us in the comments! Thanks for stopping by the blog! Good to know that even the folks who really know what they’re doing have the same issues with elderberries. And thanks for such a great guide to jam! Nice apron Allie! Will there be the vanilla and rose plum varieties around at Christmas?